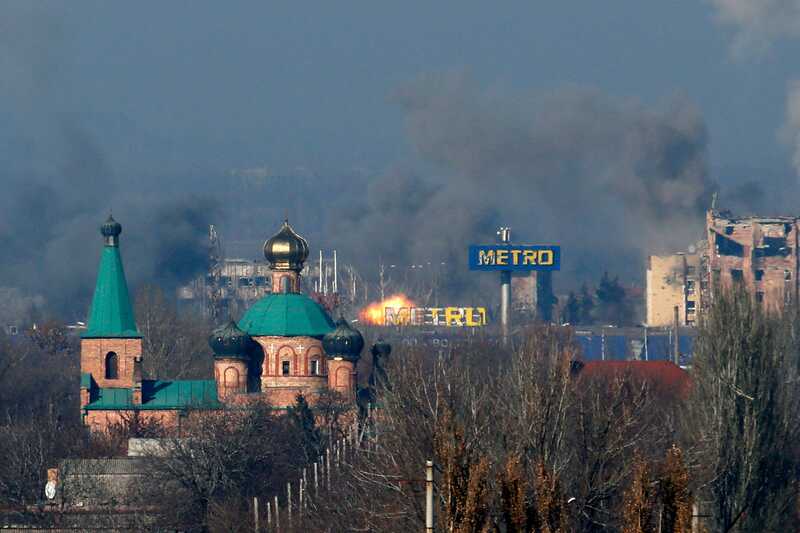 Maxim Zmeyev/ReutersSmoke rises above an old terminal and an administrative building of the Sergey Prokofiev International Airport in Donetsk after shelling during fighting between pro-Russian separatists and Ukrainian government forces yesterday in Donetsk. East Ukraine’s rebel stronghold Donetsk was pummelled on Sunday by the heaviest shelling in a month, and the OSCE said it spotted an armoured column of troops without insignia in rebel territory that Kiev said proved Moscow had sent reinforcements. A two-month-old ceasefire to end a war that has killed 4,000 people has appeared shakier than ever in the past few days, with each side accusing the other of having violated the terms of the peace plan. Reuters journalists inside Donetsk, who have been there throughout the fighting, said the shelling sounded more intense than at any time since early October. Sunday’s strikes appeared to come from territory held by both government and rebel forces. Ukraine’s military said its standoff with the Russian-backed separatists in the east had intensified in the past week, which saw the rebels swear in new leaders after elections the government says violated the terms of the truce pact. Ukraine has accused Russia of sending a column of 32 tanks and truckloads of troops into the country’s east to support the pro-Russian rebels in recent days. 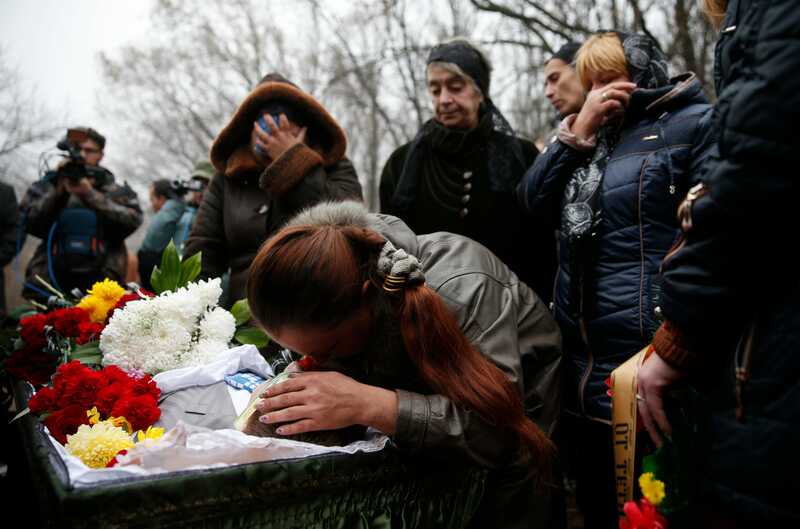 Moscow has long denied its troops operate in east Ukraine, although many have died there. The Organisation for Security and Cooperation in Europe (OSCE), which includes Russia and Ukraine as well as the United States and NATO countries, operates in East Ukraine with the blessing of all sides and is widely seen as neutral. Its statement that it spotted an unidentified armoured column in rebel territory helps support Kiev’s position that Moscow has been sending in reinforcements to protect separatist enclaves the Kremlin now refers to as “New Russia”. In one 40-vehicle convoy, “19 were large trucks — Kamaz type, covered, and without markings or number plates — each towing a 122 mm howitzer and containing personnel in dark green uniforms without insignia,” the watchdog said in statement. Ukraine said it had no doubt the new troops were Russians. “Although the OSCE did not specify to whom the equipment and soldiers belonged, the Ukrainian military has no doubt of their identity,” said military spokesman Andriy Lysenko. “The past week was characterised by an increase in the intensity of shelling and the transfer of additional force: ammunition, equipment and personnel, to terrorist groups,” Lysenko said. Reuters reporters in rebel-held Donetsk said intense shelling by heavy artillery continued throughout the night and into the early hours, and then picked up again later on Sunday morning. The shelling could be heard in the center of the city, which had a pre-conflict population of more than 1 million. “There have been rumours for a while that one of the sides is getting ready to break the ceasefire and go on the offensive,” local businessman Enrique Menendez said, describing Saturday’s shelling as a “night of wrath”. Large clouds of black smoke could be seen over the ruins of the airport, which is still under government control but which the separatists are seeking to seize. Lysenko said three Ukrainian soldiers had been killed in the past 24 hours and a further 13 injured. The media service for the military operation said two policemen and one civilian had died in shelling on Sunday. The White House National Security Council said on Sunday it was “very concerned” by the intensified fighting and reports, including from the OSCE, that separatists were moving large convoys of weapons and tanks to the front lines. “Any attempt by separatist forces to seize additional territory in eastern Ukraine would be a blatant violation of the Minsk agreements,” NSC spokeswoman Bernadette Meehan said in a statement, referring to a ceasefire deal reached on Sept. 5. OSCE Chairman Didier Burkhalter has also urged both sides to stick to the Minsk agreements. Maxim Zmeyev/ReutersRelatives and acquaintances mourn in Donetsk, eastern Ukraine, on Nov. 7, 2014. The two teenagers were killed by shelling while out playing on a school sports field in Donetsk two days earlier, the city’s administration said. Lysenko said Ukraine’s military believes Russia could stir up tension to provide grounds to “send in so-called Russian peace-keeping units”. The United States and European Union have imposed economic sanctions on Moscow over Ukraine since March, when Russia seized Ukraine’s Crimea peninsula. Moscow has since backed separatists who rose up in east Ukraine, while denying the presence of its own troops. The sanctions have hurt Russia’s economy, already facing a fall in the price for its oil exports, and have helped drive a crash in the value of the Russian rouble. U.S. Secretary of State John Kerry said on Saturday the United States and Russia had agreed to exchange information about the situation on the Russia-Ukraine border due to some “some disagreements about some of the facts on the ground”. Although Russia blames the crisis on Kiev and the West, NATO has said it has overwhelming evidence that Russia has aided the rebels militarily in the conflict. On Saturday, investigative journalists published a report on the downing of a Malaysian aeroplane over rebel territory in July in which 298 people died. The Bellingcat report said there was “strong evidence indicating that the Russian military provided separatists in eastern Ukraine with the Buk missile” believed to have brought down the plane.